Jackson on Mac: "The kind of joy he brought people is evident in this film"
LOS ANGELES, California (CNN) -- Bernie Mac's death has been hard on Samuel L. Jackson. Samuel L. Jackson says that he and Bernie Mac were "pals." The two star in "Soul Men." The two actors, who play estranged singers in the new movie "Soul Men," were anything but estranged in real life, Jackson told CNN. "Bernie and I were pals. We've known each other for a long time and we had a great relationship and ... we've been trying to find something to do together for a while," he said. "Getting this project and making it happen and understanding who these [characters] were on the inside of it was pretty easy for us, because we're both guys of a certain age who understand the creaks and aches." In "Soul Men," Mac and Jackson play two background singers who haven't spoken in 20 years. When the leader of their group, played by John Legend, dies suddenly, the two make their way to Harlem's Apollo Theater for a tribute. Jackson says Mac, who died in early August at the age of 50, brought a special kind of humor to his performance. "If you had to pick a perfect way to be remembered for an artist, especially a guy like Bernie -- the joy that this film has in it, and the kind of love and adoration that people had for him, and the kind of joy he brought people is evident in this film," said Jackson. "[The audience] will discover that he can do things that they didn't know he could do like sing, dance and carry this dramatic arc." Jackson said Mac's death was a shock. "You know the moment it happened I was kind of in that space of, 'Wow, this is a, you don't know, you just really don't know what's given and what's not given,' " he said. "I'm always finishing films and looking forward to seeing them, and I know Bernie didn't see this movie. It's kind of like 'wow.' " iReport.com: Will you see 'Soul Men'? 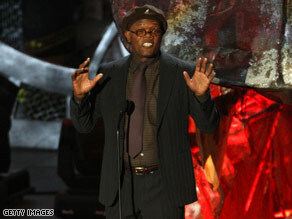 But, he added, "Soul Men" is a worthy last film for the comedian. "It's a, you know, perfect way to say goodbye to somebody that we all know and love," he said.